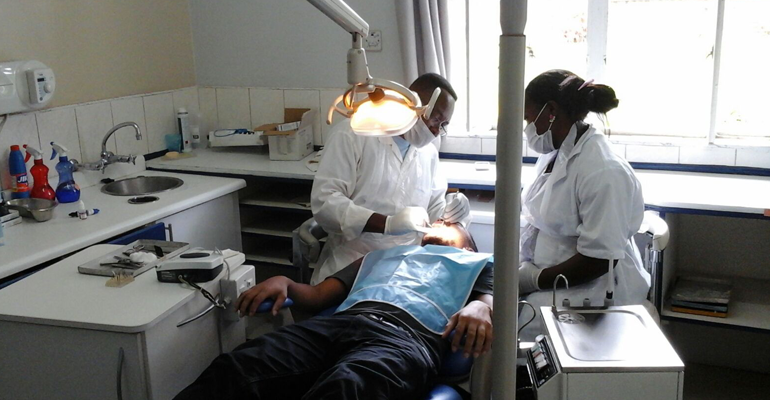 In 2013/14 the dental department at Queens Elizabeth Hospital in Blantyre was the proud beneficiary to a brand new dental surgery, thanks to MAHECAS-UK who donated the Surgery. To this day, the surgery is an icon of modern dentistry within the hospital. So many members of the community continue to enjoy the services at the dental department than before. Now, the hospital has a resident dentist who works full time in the surgery. Because of the dental surgery donated by MAHECAS, the hospital is now recognized as a fully-fledged dental department hence from time to time Malawi College of Health Sciences has seen it fit to utilize our facility for practical attachment for the 3rd year dental therapy students. In order to enhance and expand our service delivery to the public, the hospital requested MAHECAS to replace the mini dental x-ray processor (portable). MAHECAS has since procured and donated the X-Ray processor that was requested. From: Gelson Kuweruza, Principal Dental Officer & Oral Health Coordinator (South West Zone), Queen Elizabeth Central Hospital, BLANTYRE, Malawi. On behalf of the entire dental department at Queens, I would like to express our profound gratitude for what Mahecas has done in procuring a brand new Xray machine for the department. We shall use this piece of equipment responsibly! Thank you so much for the quick response. May God bless you in your endeavors as you continue with various projects across Malawi. Let me however humbly point out that out of the submitted requests in January this year, there are still some items in that list that we are keenly looking up to you to fulfill. Viz;- 2 dental drill delivery system, and 2 mobile suction units. in this regard we have found Dr Willis Kabambe’s guidance so valuable and I believe he would be please to give direction on said items. Otherwise as earlier on stated, we are so thankful for the support you have always given us! Please extend this vote of thanks to the whole Mahecas community. As can be appreciated from the pictures, the machine is already in use! Kind and very warm regards to all. Please click here to see an MBC News article about this donation. Also see another video on Improving Dental Care in Malawi here.